Caltrain is working on a major business plan that will set the stage for potential significant improvements to service in the age of electrification, and for the investments that will be needed to deliver those improvements.Â Â The South San JosÃ© and South Santa Clara areas have opportunities for particularly dramatic service improvements, that will require decisions from the Caltrain board and input from the community. 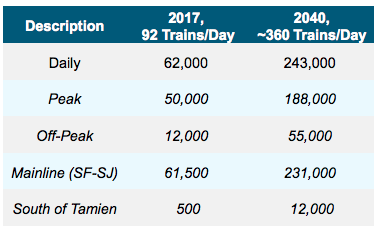 As people who live in SSJ and South County know well, the highways are crowded, but Caltrain provides minimal service.Â Diridon station has 15 trains at peak period, but there are only 3 trains per direction per day south of Tamien. There is already funding available for some service improvements to South San Jose and South Santa Clara County, passed by voters in 2016 as part of VTA Measure B. Now thatÂ an appeals court has upheld the ballot measure, the funding, which has been accumulating, will become available. 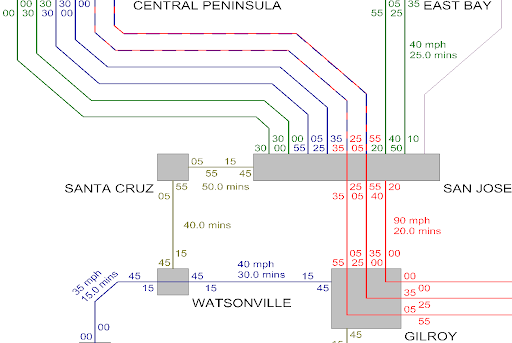 According to earlier plans, service could be increased from three trips per direction per day to five trips per direction per day, using diesel trains, if approved by Caltrain and VTA.Â One important question to ask is how soon this could be done – does it need to wait until Caltrain starts electric service in 2022, which would free up more diesel equipment, or could it possibly start sooner? Analysis of census data shows pent-up demand, especially in South San Jose.Â Many residents live near Caltrain butÂ service is minimal, contributing to low ridership. Plus, additional service could help free up parking space at Diridon and Tamien.Â An estimatedÂ 30-40% of Caltrain riders at Diridon and Tamien live in South San Jose.Â Â Up to 300 cars that currently park at these stations could potentially be parked closer to home. 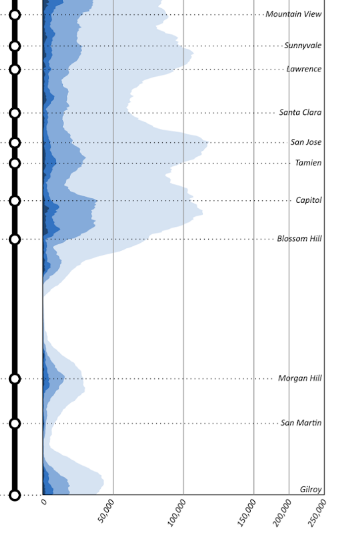 The South San Jose stations see much lower ridership than stations with similar populations in the catchment area. Caltrain’s business plan estimates show the potential for substantially higher ridership than today. Another major opportunity for improvement wasÂ included in the most recent business plan for High Speed Rail, which proposed to electrify passenger rail service between Tamien and Gilroy. In previous plans, the High Speed Rail Authority was proposing to build dedicated tracks, while Caltrain would continue to run diesel service on tracksÂ owned by Union Pacific freight. Now, pending the results of negotiation with UP, the High Speed Rail authority is proposing to electrify tracks, providing two tracks for passenger trains shared among Caltrain and High Speed long-distance trains, and one track for freight trains. This proposal could allow electrified Caltrain service potentially as soon as 2027, with High Speed long-distance train service starting as soon as 2029. And opportunities for additional regional connections are being pursued by the Transportation Authority of Monterey County, which is pursuing service to Watsonville and Salinas as supported by the State Rail Plan. If you liveÂ in San Jose, including South San Jose and South County, you can attend tonight’s meeting in San Jose, or can share your thoughts by writing to businessplan@caltrain.com, and watch for additional opportunities to weigh in. Caltrain contract with UP specifically forbids Caltrain from pursuing electrification south of Tamien. 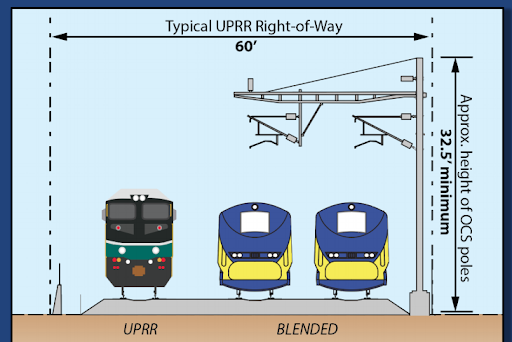 While CAHSR authority is not Caltrain, such strong language foreshadows how unwilling UP will be with that idea.